How much style can we get from a rectangle of fabric? Quite a lot! These designs are all based on the traditional Kimono design which is composed of rectangles. I have taken a liberty here and there to add interest. 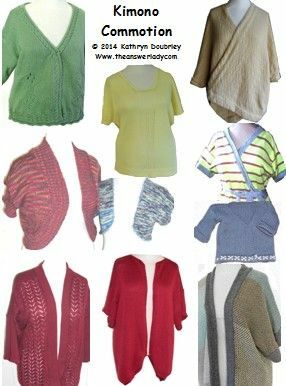 These are easy to knit, easy to fit and generally fun to make and wear. Book is $20 as an instant download. Note to Passap knitters: Most of my patterns are possible on Passaps and the instructions wherever possible include Passap notes. The notes are in DM80 terms. The designs are also possible on E-6000s but the knitter must look up the tech numbers for herself and some of the dial settings differ between the two models so you'll need to be aware of that fact, too.